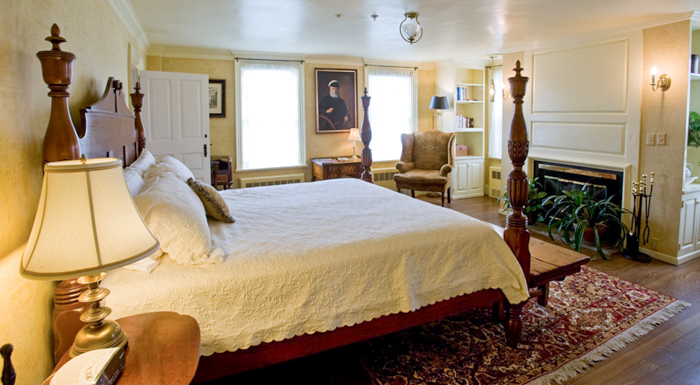 The Inn at Mount Hope Farm has three separate buildings, each with lovely guest rooms with private bathrooms, air conditioning and comfortable furnishings. 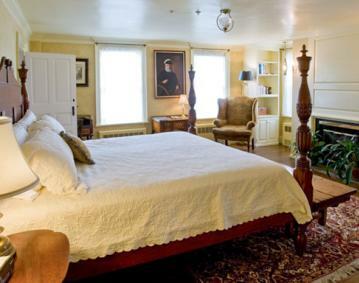 There are five (5) rooms in the Governor Bradford House, an historic 1745 building with a living room, library and dining room as well as an inviting stone patio to use for relaxation. Common areas are furnished with antiques and offer quiet spaces to sit, read or enjoy the flowers and fresh air. South Pasture is a smaller building with three guest rooms and North Pasture can be rented by the room (there are four bedrooms) or you can rent the entire four-bedroom, four and a half bath house. Mount Hope Farm is a non-profit and consists of 127 acres, a waterfront Cove Cabin and raised bed vegetable gardens as well as a number of goats, donkeys, sheep and chickens. Farm fresh eggs are used for the Farm’s country style breakfasts in season.